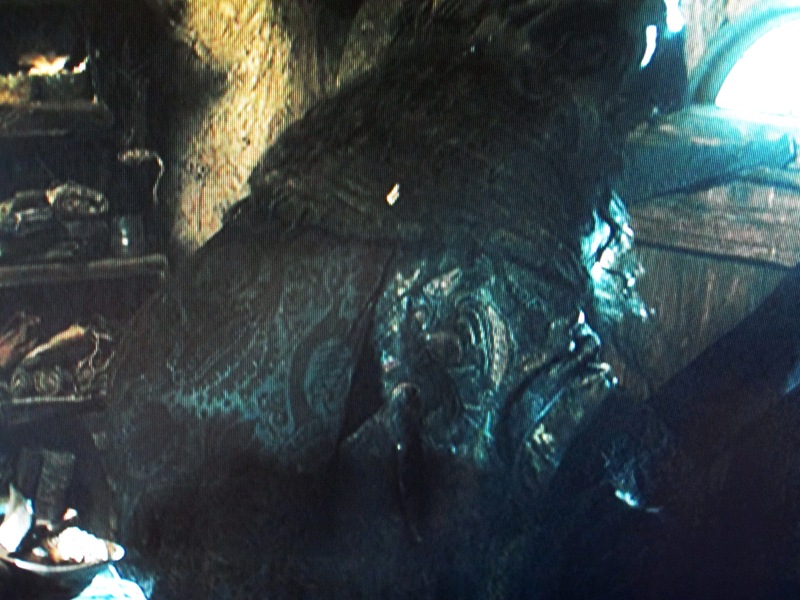 Radagast the Brown, featured in the first two Hobbit films, has a wonderfully layered costume of waistcoats and robes, all in what were originally very rich fabrics that have aged and distressed over his years in the woods. 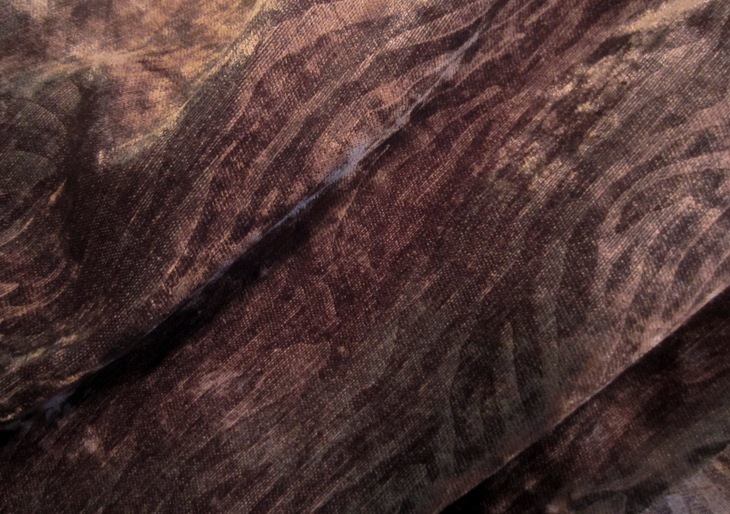 It is not easy to find rich brown fabrics on six weeks’ notice! 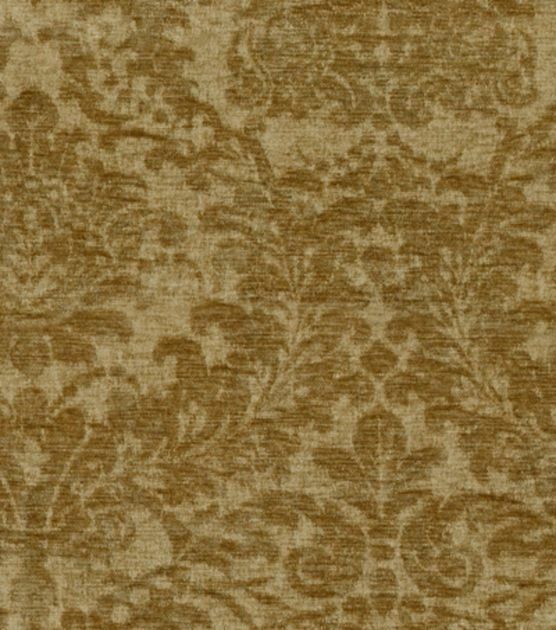 We originally found a gorgeous deep gold upholstery chenille with exactly the right weight, drape, and already-aged-ness to it. The only trouble was the color! 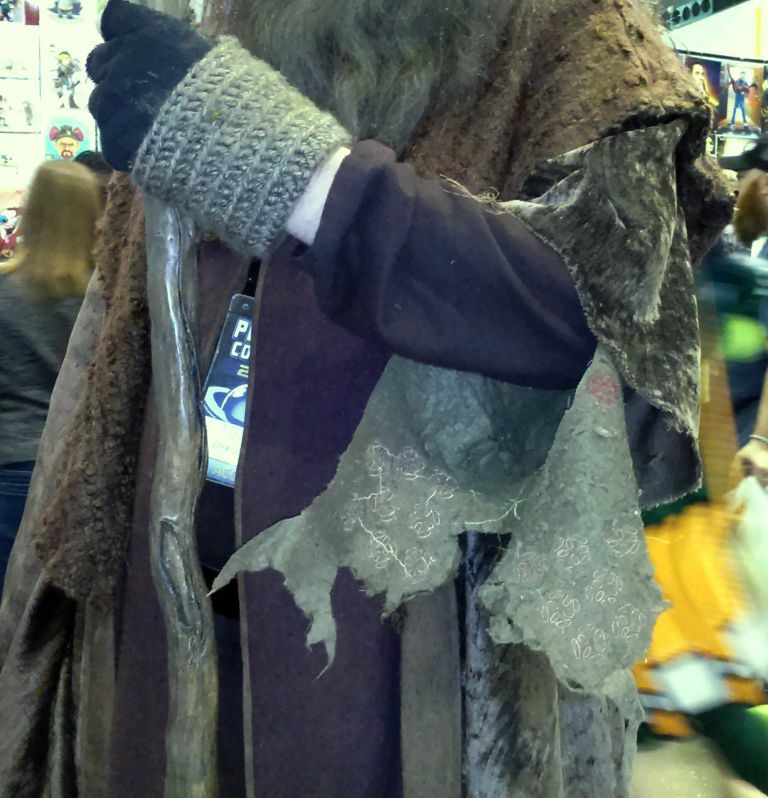 As Milord said, “He’s Radagast the Brown.” We purchased it anyway (all 10 yards), and did research into dyeing it. It was 100% polyester, so we stocked up on idyepoly from Jacquard dyes… and kept hunting, just in case. Zebra velvet! Part of the luscious sheen comes from the fact that it’s been cross-woven of darker and lighter brown threads. Fortunately, we stumbled across a second contender that was almost as perfect—a weighty, drapey upholstery velvet in very dark brown… zebra print. We thought Radagast would approve. And since it was roughly 1/4 the price of the gold, without the extra effort of dyeing, SOLD! 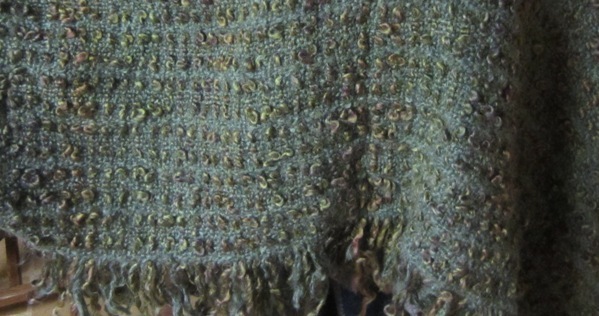 For his heavily textured shawl collar, we already had the perfect fabric: A nubby wool-blend boucle throw in beautiful shades of green and brown. We DID end up dyeing that—twice (once by machine with Rit powder, once on the stove with Rit liquid). All that agitation caused the wool to full rather a lot, making lining the collar (my original plan) unnecessary… but also meaning it was now too small to lay out the collar pattern in a single piece. I disguised the seams as best I could along the shoulders. 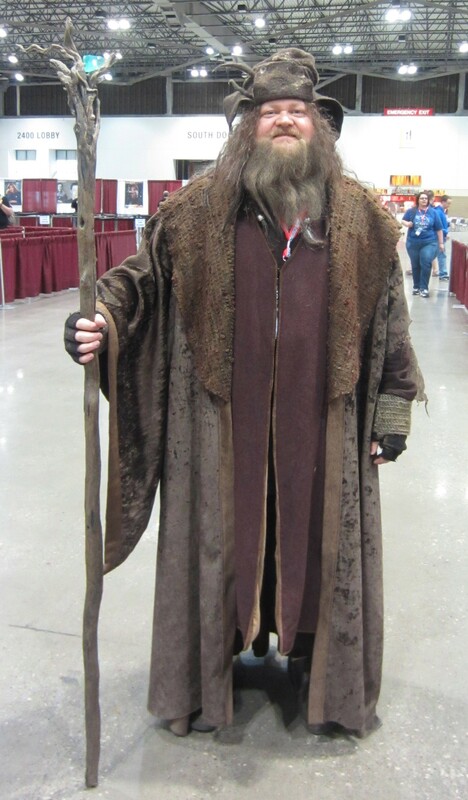 In place of the waistcoat, Milord is wearing his existing Gimli tunic of raisin brown wool flannel. I still would like to make him a “proper” Radagast waistcoat, with fancy trim and mismatched buttons. …It got stuck in customs!! 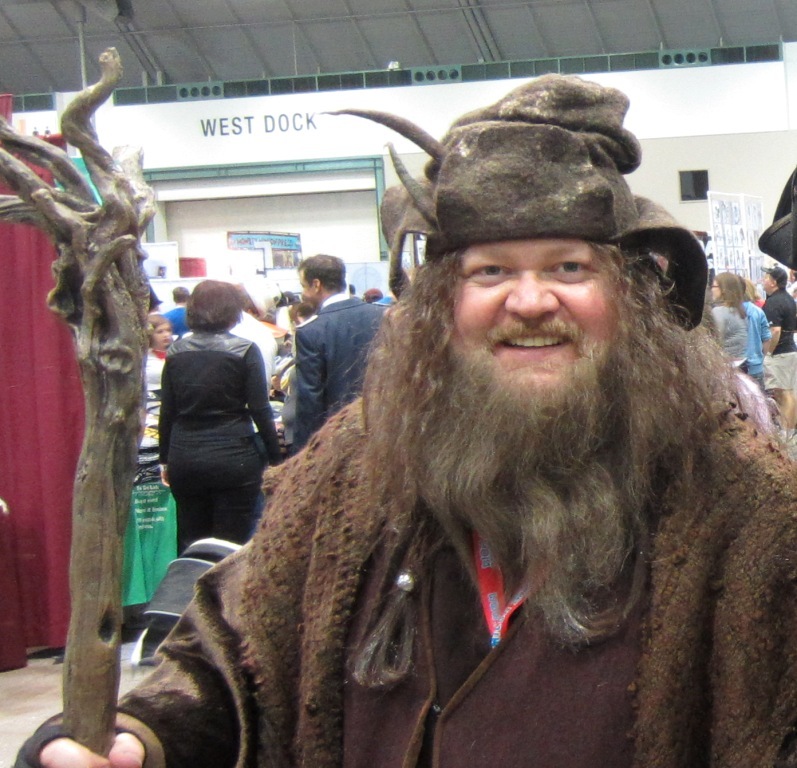 You just know those NYC customs officers were taking Radagast selfies and posting them on Instagram. In a panic, we whipped up our own emergency backup version from fleece (sported by Mr. McCoy, above). There was a mad scramble in the last week before the convention, but Deborah’s hat at last (sort of) arrived in Kansas City… where it promptly bounced around to every possible post office in the metro (sometimes tracking info is more of a curse than a blessing!). Finally, Milord managed to track it down, just in the nick of time. The wig is actually a licensed Thorin Okenshield wig , turned upside-down so it’s a bit less full; and the beard is a very nice stage beard (natural human hair on mesh) purchased from a local theatrical supply shop. 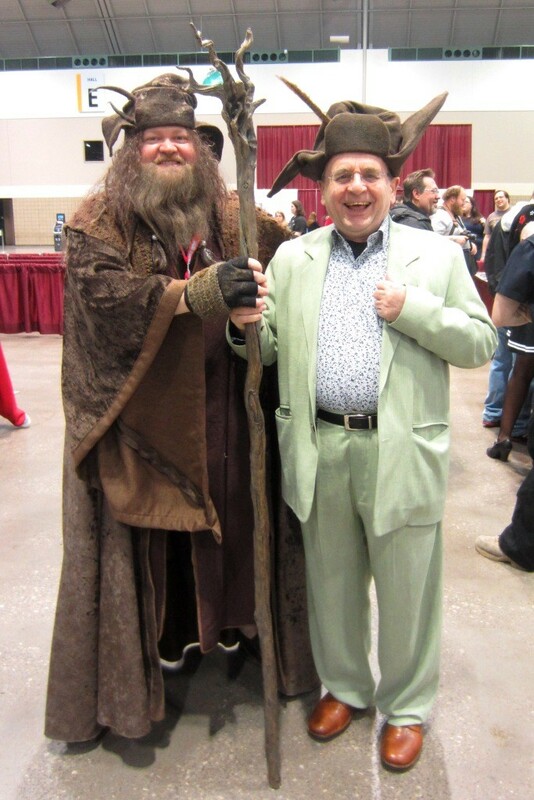 We ran out of time to do the last bit of famous distressing to Radagast’s costume—the bird droppings in his hair. Alas! The staff is a screen-accurate replica made by Weta (the prop house that makes all the Hobbit and Lord of the Rings movie props). A few final details, including the ripped-off left sleeve (genuinely ripped-off! As I was doing it—it’s not that easy to tear very good upholstery fabric!–I felt a rush of determination, followed instantly by OMGwhathaveIdone? I got over it.). To add a little extra… we found a scrap of embroidered wool, genuinely shredded by wildlife! (It used to be a dog bed.) The arm warmers were crocheted by Milord’s mother, from the Stansborough Bofur gloves pattern. All in all, we had a really wonderful time. Mr. McCoy was warm and hilarious and a great sport to wear my hat for the photos. We wished we could have hung out longer. So much cosplay, so little time.